08-Jul-2015 -- Many large cities that are frequently visited by travellers have what I like to call a “Visitors’ Confluence Point” - a point that is in, or close to the city, and is easily accessible by public transport or by rental car. Visitors to the city (on business or vacation) will often take time to visit this point. Consequently, these "Visitors’ Confluence Points" tend to be the most visited points of all. This Degree Confluence Point 49N 2E is the "Visitors’ Confluence Point" for Paris. It lies just to the north-west of Paris proper, but is easily accessible by train from Gare Saint-Lazare. Therefore, while on a week’s vacation in Paris, I made time to visit this point. The first few days of my vacation were hot (with temperatures in the 30s °C), so I waited for an overcast, cooler day (with temperatures around 20°C) before making this trip. From Gare Saint-Lazare I made the 45 minute train trip to the village of Triel-sur-Seine, which lies just over 2km - as the crow flies - from the confluence point. From the train station, I hiked up a series of tidy suburban streets towards the forest where the point lies. At 48.99116°N 2.00298°E, a paved street turned into a dirt path as it entered the forest. 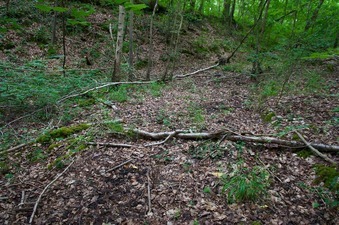 A set of well-travelled dirt paths continued through the forest, one of them passing just to the east of the confluence point - which (as the many previous visitors have noted) lies in a hollow (formed from former quarrying operations). The view from the confluence point is not particularly interesting, but just 400 m to the East (just outside the forest) is the "Observatoir de Triel-sur-Seine", which is worth a visit after reaching the point.